Blender dressings are great, in part, because they're fast. Everything into one container, puree, and you're set. This is a dressing I tend to make quite a lot in the fall, and then I just keep on going all the way through winter. 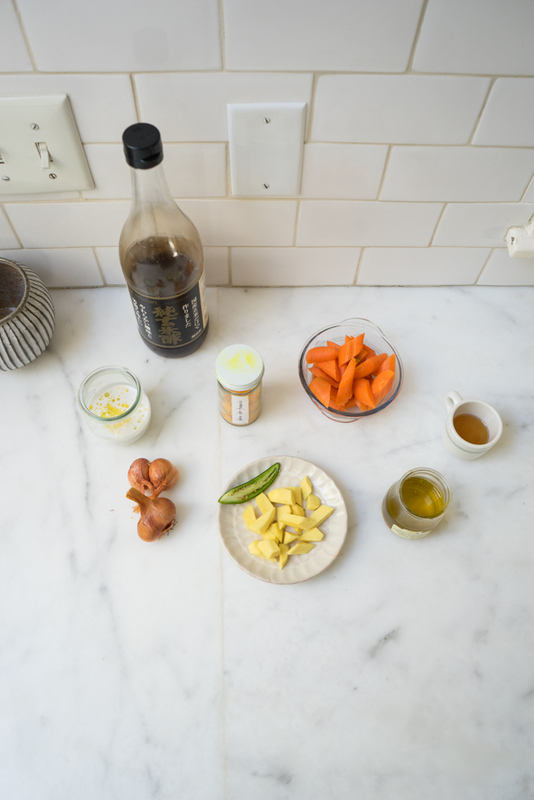 It's an incredibly versatile blend of favorite ingredients like carrots, turmeric, coconut milk, ginger, and sesame. Also, lots of shallots. Which, as we know from last week, I rarely skimp on. I use this dressing on green salads, grain salads, and as an A+ finishing touch over sautéed, steamed, or simmered vegetables. It works nicely in cold, summery noodle salads, and as a dipping sauce for crudité. This is all to say, it's great on many things. I'll list of some specific ways I've used it recently below! Noodle salad: Toss soba noodles with it and then go from there, adding other favorite seasonal ingredients - roasted vegetables, toasted seaweed, tofu or whatever protein you like, etc. Farro Salad: I did this as a side for Thanksgiving - combine farro, lots of toasted seeds, and plenty or arugula in a large bowl and toss with a generous amount of the ginger carrot dressing. A number of you were curious about a winter miso chowder I posted a photo of to my instagram feed recently. I'm going to write it up next. Making it again tonight, and fine-tuning the ingredient amounts. It's definitely a hearty, winter warmer. Sometimes I use 1/4 teaspoon ground cayenne in place of the Serrano. Also, you can freeze any dressing you don't use in a few days. 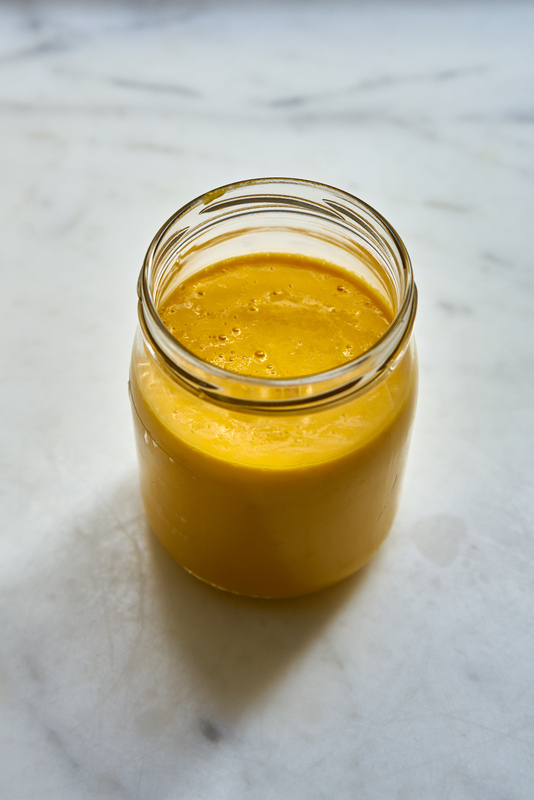 Puree the coconut milk, turmeric, ginger, carrots, pepper, olive oil, salt, toasted sesame oil, miso, maple syrup, brown rice vinegar, and shallots in a blender until very smooth. Taste, and adjust, if needed, with more salt or vinegar, or any other ingredient you think might need a little boost. A bit of very belated Spring cleaning + a shallot vinaigrette made with rosé wine in place of vinegar. A simple salad made with crunchy lettuces, a garlicky, melted lemon butter dressing, and shaved endives, delicata squash, avocados, and pepitas.